Clearances are established to ensure public and worker safety, prevent a power outage and/or allow space for operating, maintaining, and replacing the electricity distribution infrastructure. Should any activity, such as tree trimming or working on the sides of a building, be anticipated within three meters (3m) of Hydro Ottawa’s overhead lines, contact Hydro Ottawa to discuss arrangements before any activity is undertaken. In line with the Ministry of Labour’s Occupational Health & Safety Act, only a Hydro Ottawa employee or Hydro Ottawa approved contractor can work in proximity of these lines. Permanent structures within the "restricted zone" surrounding overhead lines are prohibited. This zone is defined by Hydro Ottawa's OLS0002 standard. This standard complies with the requirements of the Ministry of Labour's Occupational Health & Safety Act and the Ontario Electrical Safety Code that strictly prohibit any work activity within 3m (plus conductor swing), of high voltage lines. The resultant clearance of 5m allows some room for construction and future maintenance of the structure. Permanent structures proposed near underground high voltage infrastructure shall remain outside the restricted zone (OLS0002). Permanent structures that include buildings, signs (even lit signs when open for maintenance), antennas, pools, or fences must also maintain the proper clearances from overhead and underground distribution infrastructure. Clearances also apply within easement areas. It is your responsibility to ensure that any landscaping or surface finishing does not encroach into Hydro Ottawa's overhead or underground electrical distribution system or easements once the proposed electrical servicing design is approved. When planting in proximity to existing power lines, refer to Hydro Ottawa’s free publication "Tree Planting Advice" (also available by mail). The shrub or tree location and expected growth must be considered. If any Hydro Ottawa related activity requires the trimming, cutting or removal of vegetation, or removal of other landscaping or surface finishing, the activity and the re-instatement will be done at the owner’s expense. The minimum clearance required between existing or proposed Hydro Ottawa underground distribution infrastructure and proposed hardscaping is 1.5m. The ideal planting location near underground utilities would have a minimum lateral clearance between the edge of the root ball or open bottom container and adjacent edge of the existing utilities of not less than 1.2m. In cases where clearance cannot be maintained, a minimum clearance of 600mm may be permitted provided a steel plate or bio-shield is used per the instructions in Hydro Ottawa's "Tree Planting Advice" brochure. Under no circumstances is a tree to be planted directly over an existing underground structure. Also, where padmounted transformer is installed, refer to Hydro Ottawa's clearance specification UTS0038. A tree shall be placed so that at maturity it is no closer than 1.5m to a Hydro Ottawa distribution pole. When a tree is to be placed within 4.5m of either side of an overhead pole line, the selected tree species shall at maturity be shorter than the lowest of either six meters or the distance to the lowest overhead communications or current carrying conductor, subject to CSA 22.3 Part 1 "Overhead Systems." Any change in grade by more than 0.3m in the vicinity of existing electric utility infrastructure must be reviewed with Hydro Ottawa in order to determine the impact, if any, on its assets. 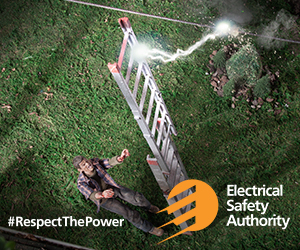 Landscaping, blocking access, or covering up electricity distribution infrastructure is not permitted. Should the asset need to be operated, maintained or replaced, the homeowner will be responsible for added cost should Hydro Ottawa have to remove the obstruction or power restoration is delayed. See Section 3.0, especially 3.0.3 and 3.0.4 in the Conditions of Service. Hydro Ottawa may have an easement or need an easement on your property. You are obligated to keep the easement accessible, free from obstruction, and un-built (i.e., no landscaping or finished surfaces). For information refer to "re-instatement" of property within the easement, and clearances on this page and in the Conditions of Service, Section 3.0, especially 3.0.3, 3.0.4, 3.0.7 and 3.0.8. Hydro Ottawa's publication "Swimming Pools in the Vicinity of Electrical Wires" details the information you need to be aware of and regulations that need to be followed when installing a pool. Overhead powerline contact is still the leading cause of electrical-related deaths in Ontario. Make sure to be safe and stay clear of all overhead and underground powerlines when working outside or doing household chores.